In a recent survey, The Organization for Economic Co-Operation and Development (OECD) asked the question: “Time for the U.S. to Reskill?” and the answer was a resounding: “Yes”. Basic skills (literacy, numeracy, and problem solving) matter and we need to invest in an infrastructure that transcends across high school, higher education, and professional and career development to achieve higher level competencies. 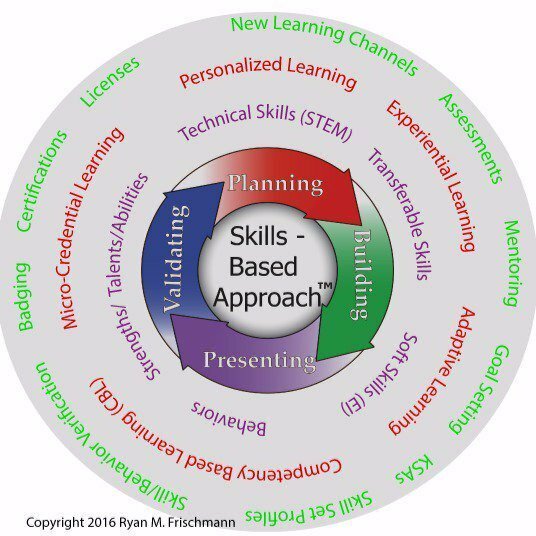 Using skills as a language to bridge learning expectations across education and career stages has been something I have proposed for a while now and one of the central premises behind Skills-Based Approach. The survey has many interesting distinctions regarding reskilling our workforce. Here are a few of them. “Sixty-three percent of low-skilled adults in the U.S. are employed”. So job training and learning is possible and there are proper incentives to do so (reward for basic skills is higher in the US than other countries) and “an intervention should yield lifetime returns”. Whenever possible, employers must invest in learning and career development programs for their workers; employers have the resources (funding), captive audience (workers), and applied knowledge (mentors) to do so. In addition, employers should take preemptive action with education institutions and the community to support building skills needed for their future workforce. U.S. lags on both tails of basics skills measurement – a higher rate for low basic skills and lower rate for high basic skills. For example, on the low end, ‘one in three adults have weak numeracy skills’ in this U.S. compared to ‘one in five’ for the cross country average. And, on the high end, ‘8 percent of adults scored the highest level’ in the U.S. compared to a ’13 percent cross-country’ average. The U.S. has a large, diverse population. Immigrants represent a large portion of the low basic skill adults, so low literacy rates are expected. But still, with such varying results across countries, education systems and learning cultures do influence the outcome of acquiring basic skills. There are reasons why Finland, Japan, and Germany score higher on standardized tests like PISA. Perhaps the applied learning and apprenticeships Europe has fostered for the past hundreds of years makes sense. Here in the U.S., we are now seeing growth in this type of learning as an alternative to higher education programs. In my personal experience, while attending an MBA program where about fifty percent of the students were from other countries, I noticed stark contrasts in learning approaches. Many of the students from Asian countries (including India) demonstrated strong quantitative skills and took a methodical approach to their learning. A concerted effort is needed to address the skills challenge because ‘skills matter’ and US ‘will progressively fall behind other countries’. ‘Substantial improvements’ are needed in initial schooling, with ‘adequate standards’. The US has a young population, there is evidence from PISA of gaps in current schooling, and interventions have been proven to be successful. Effective ‘learning pathways’ are needed for young adults leaving high school. US already has an extensive higher education system, but there can be improvements. In addition, we are experiencing growth in micro-credential and certification paths. Programs to address basic skills must be linked to ‘employability’. If you take an assessment and demonstrate a competency, then you will be employed doing this type of work. Adult learning programs should be adapted to ‘diverse needs’, and ‘effectively coordinated’. Awareness of basic skill challenges must increase. Educators need to find gaps in the system. Employers and community organizations need to forecast and plan for future skill demand and competency requirements. Actions should be well-supported with evidence. Skills-Based Approach is a methodology and platform to address many of these recommendations (particularly the top five). In the Skills-Based Approach application, users track their skill set and move through stages constantly throughout their lifetime. It suggests personalized, adaptive, and lifelong learning. Users tap into employability and career pathways as they mature. They may plan for careers five years in advance while working in short discrete tasks throughout their education. The benefit is users can pivot or respond to external (changing demand for skills) and internal (success, progress, or failure in acquiring skills) factors. Previous Previous post: Should We Drill Through Foundational Thinking and Social Skills (Like We Do In Sports)?